Does Sony's ACID Music Studio cut the mustard as a budget DAW? A solid entry-level package with some nice extras. A lack of automation may hold you back. Accurately priced. 3,025 included loops. Good time-stretching abilities as standard. Bundled VSTs and samples are nothing to write home about. Lacking in features for advanced DAW users. 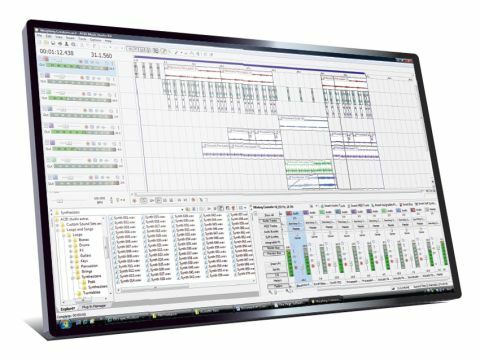 It's not unusual for producers to use more than one digital audio workstation for projects. For many, Sony's ACID has become an integral part of the studio setup, but not necessarily the hub. Over time, its simple interface and ability to time-stretch have been its strengths. It seems Sony has recognised that in this budget-DAW market, you need to throw a few sweeteners into the package to stand out from the crowd. Firstly, there are two free VST plug-ins: Studio Devil British Valve Custom (BVC) guitar amp and TruePianos Amber Lite soft synth. On top of this, Sony has included 3,025 free loops. At a grand total of £50, do these extras add value, or are they merely covering up its inadequacies? The extra loops definitely prove a good starting block for those who are starting out in music production. However, these freebies won't blow your mind. With ACID Music Studio only able to run at a bit-depth of 16-bit and the highest sample-rate at 48kHz, you're unlikely to find much use for them anywhere else. As for the TruePianos soft synth and Studio Devil's amp modeller, it's pretty much the same story. They are cut-down versions of already existing VSTs and don't offer anything ground-breaking. Unsurprisingly the look and feel is the same as ACID Pro, which has hardly changed in the last 12 years. This does count for part of ACID's charm and the interface is really one of the program's strengths. For beginners, it's ideal to have everything in one place, and intuitively so. Unfortunately, ACID Music Studio didn't automatically opt to use the hardware plugged into the PC. The same goes for the plug-ins, which aren't as clearly implemented as they are in other software, but the interactive tutorials will take away the pain and frustration. To use ACID Music Studio simply as a sampling tool would be acceptable at this price, but its real strength lies as a starting platform into music production, but in lacking certain key features it will always leave more experienced DAW users underwhelmed. The exclusion of plug-in automation and busses are a bit of a shame, but for the beginner, it strikes a good balance of power and ease-of-use. With the angle on producing your own tracks for the first time or even just for the web, there's more than enough here to get the creative juices flowing.